Downtown Barrie is an anchor district that has historic roots and heritage dating back well over 200 years as a strategic war route, a central transportation hub, a leading agriculture and natural resource economy. Our famous 5 Points roadway intersection is the hub of our main street and is the locale for many historic buildings with many historic ‘stories’. Be sure to make your visit something of the past, present and future; it is something worth discovering! Over 200 years ago, what is now Downtown Barrie was the beginning of the Nine Mile Portage. 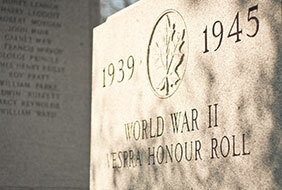 This important link on the journey from Lake Ontario to Lake Huron provided Canada’s 1st Nations people with a peaceful shore to rest on before their long portage trip. During the war of 1812, this area became a detour, allowing British supplies and troops to safely bypass the U.S. forces on their way to Upper Canada’s military posts. An initial cluster of storehouses and homes developed at the war’s end. This became the first settlement in the newly crowned town of Barrie, named after British Admiral Sir Robert Barrie Commodore. The first streets were named after British officers Collier, Bayfield, Owen and Poyntz. These streets, with the original names intact, constitute much of present day Downtown Barrie. The extension of the railway to include the Town of Barrie in 1867 allowed the town to expand its transportation, agriculture and natural resources industries. Downtown Barrie experienced many fires between 1870 and 1880. One such fire destroyed the entire North side of Dunlop Street from Bayfield to Owen. Since many of these buildings were wood-frame construction, a bill was enacted prohibiting construction of wooden-sided buildings downtown. 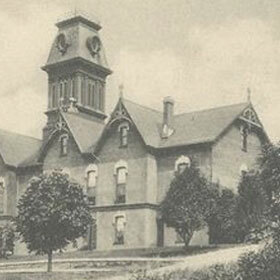 The brick streetscape of solid buildings was erected after this devastating fire and some remain until this day. The construction of these buildings turned Barrie into a town, complete with a commercial centre. 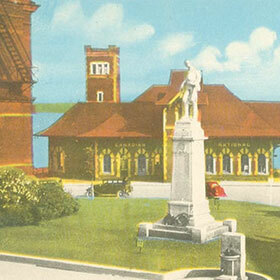 One of the most famous landmarks in Barrie, the Five Points intersection, was coined as such in the 1870′s. Lakeshore Drive connected Barrie with Allandale, blurring the boundaries between. The construction of highway 400 in 1950 allowed for more traffic flow which accounted for much of Barrie’s growth. A stroll through Downtown Barrie will excite and delight you as you will find modern day conveniences coupled with beautiful historic treasures. Many of our older buildings, which now house specialty shops and boutiques, have been kept up over the years or given new facades that exemplify their historical importance. The future is bright in Downtown Barrie. 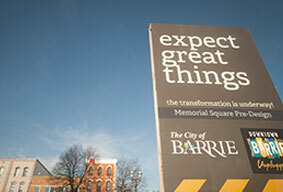 The strategic growth development of commercial, residential, educational and public spaces will continue to support Downtown Barrie and our beautiful Kempenfelt Bay; where our community, friends, family and visitors come to meet, gather and share memories that ultimately make Barrie what it is and what it aspires to be – as our city centre.